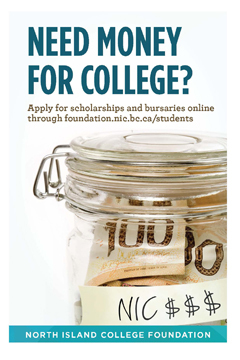 Every year, as a new, continuing or graduating NIC student, you are eligible to apply for more than $375,000 in scholarships and bursaries to help pay for college. These generous financial awards are made possible through the NIC Foundation by friends of North Island College who believe in the importance of education, and who want to ensure that finances don't stand between you and your career goals. Students and parents! Contact us with your questions or like us on Facebook to stay informed of opportunities and deadlines. Only one application is required to be considered for more than 415 NIC Foundation awards which range in value and type of award. Scholarships are awarded for outstanding academic achievement while bursaries are based on financial need. Our 2019 application form will be available on March 1, 2019. Successful recipients will be notified in the summer via your NIC email address. If you have any questions or concerns please call 250-334-5074 or email us at foundation@nic.bc.ca. If you are a student on March 1, 2019 or plan to attend NIC at any point during the academic year ending August 31, 2020, you are eligible to apply. The online application form has several sections with specific questions related to your personal, NIC and financial details. All applicants will be asked to provide a Social Insurance Number which is required to generate a T4A upon receiving an award. Bursary applicants will need to provide Line 150 from their most recent Tax Notice of Assessment. Dependent students will need to provide their parent/guardian’s most recent Line 150 from their Tax Notice of Assessment. Graduating high school students will need to provide interim transcripts directly to NIC Admissions. Give yourself enough time to complete the online application. You will have the option to save and edit your application and to skip sections of the form that are not applicable. Read questions carefully, provide thorough responses and proof your work. We are here to help and answer questions related to the application process. Email foundation@nic.bc.ca or call 250-334-5074. The NIC Foundation Awards Application is available online between March and April each year. With one application, you will be considered for all awards for which you are eligible. To submit your best possible application, please be as detailed as possible in your responses. Detailed information helps the selection committee match you to relevant awards. Upload all required documents using the online application and submit before the April 24th, 2019 deadline. If you are chosen to receive an award, you will be notified in the summer via your NIC email address. If you are not chosen, no email will be sent. Try not to be discouraged. Every year, regrettably, the number of deserving students exceeds our available funds. In nearly all cases, funds will automatically be deposited into your NIC student account to reduce or cover your fall tuition. This will be communicated by email to your NIC address. Award recipients must submit a thank-you note to the NIC Foundation which will be passed on to your donor. Most award recipients are asked to attend a fall Awards Reception to show appreciation to donors. Reception details will be communicated by email to your NIC address. Tell us how receiving an NICF scholarship or bursary made a difference for you. Email foundation@nic.bc.ca.